H.J. 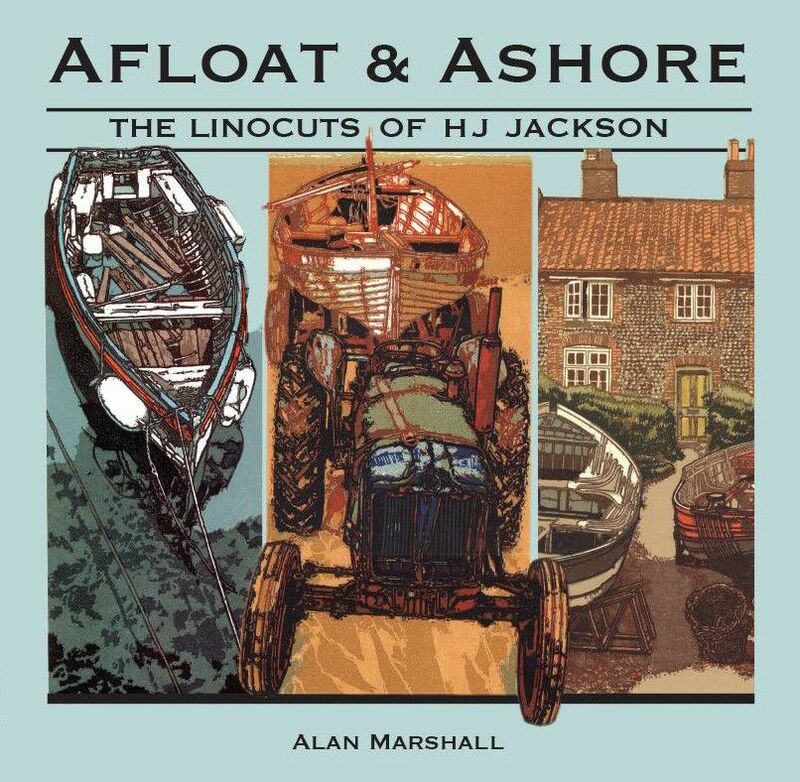 Jackson – highly collected and hugely popular Norfolk print artist - celebrates the release of his new book Afloat and Ashore with a showcase exhibition at Gallery Plus in Wells-next-the-Sea. When H.J. Jackson produced his first hand-printed linocut in his last year at school, he had no way of knowing that over 60 years later he would still be printmaking. This small single-colour print of a galleon in full sail was instrumental in helping H.J. Jackson – John to his friends – to obtain a place at the Norwich School of Art the following year. It was also directly responsible for him pursuing linocutting as a craft as part of the National Diploma in Graphic Design. 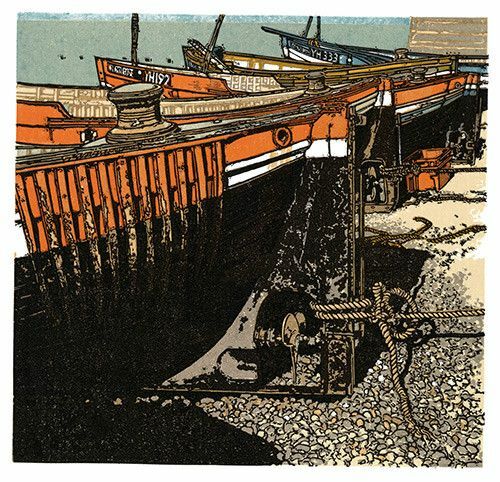 It was while at the School of Art that John became interested in coastal themes, stimulated by visits to Sheringham, Cromer and to the fishwharf at Great Yarmouth during the annual visits by the Scottish Fishing Fleet. By the end of the 1950s, however, his interest was taken up with the closure of the local Midland and Great Northern Joint Railway, where his father, grandfather, and other family members had all worked and the clearance of large areas of Victorian Norwich. On leaving Art School, John lost the use of the print-room equipment and although he could purchase tools, lino and ink, he realised he would have to dispense with the services of a printing press. After experimenting, he finally settled on a ‘tobacco tin’ as the ideal burnishing tool – a method he still employs today. 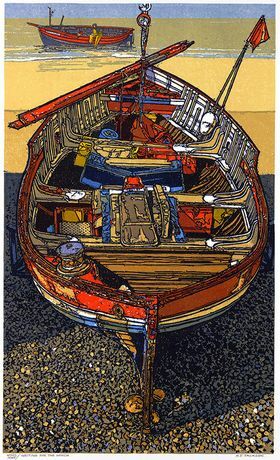 After working for over 30 years in marketing and publicity, printmaking during evenings and weekends, John was able to pursue linocutting ‘full time’ in 1995. 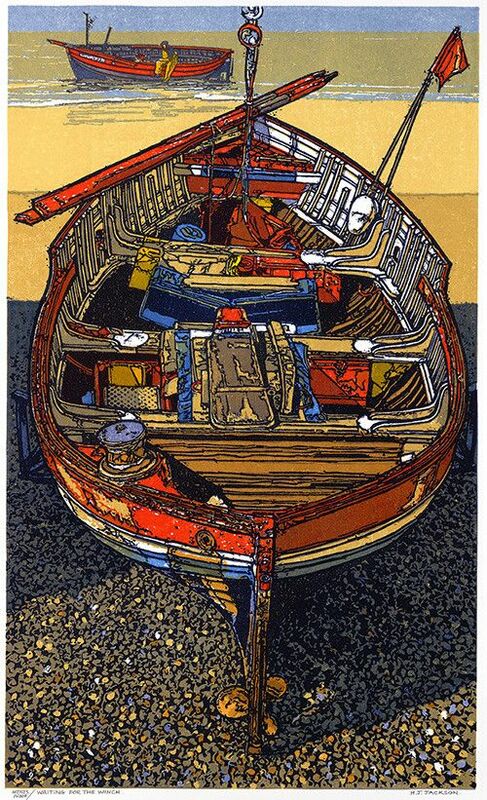 Now a Senior Fellow of the Royal Society of Painter Printmakers and a Member of the Society of Wood Engravers, H.J. Jackson has perfected his craft. Working from photographic reference, John produces a drawing to the size of the proposed print. He then plans the number of lino blocks needed, some printing more than one colour. The drawing is photocopied onto tracing paper, reversed and transferred using carbon onto the lino. With drawing ink, he identifies the areas to be retained before cutting using only two tools: a V tool and a small gauge. The different blocks are printed using oil based inks and pin-hole registration. The printing is carried out entirely by hand burnishing using the tobacco tin. 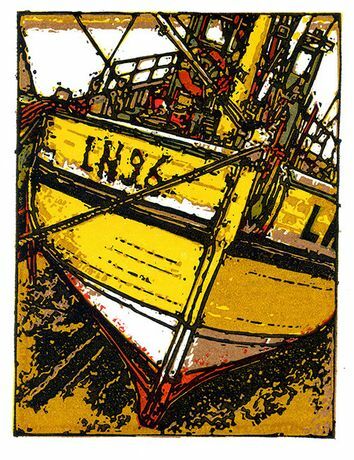 The declining fishing industry features strongly in John’s work, and he likes his boats to look as if they have been to sea. The multiple layers of ink result in a ‘treacly’ appearance which helps to gives them the look of working vessels. To mark the release of his new book ‘Afloat and Ashore’, H.J. Jackson will be exhibiting a showcase of his recent linocuts, including his much loved images of Norfolk boats, at Gallery Plus, Wells-next-the-Sea. The exhibition, which will also include work by other Gallery Plus print artists, opens with an all-day preview on Saturday 24th October – all welcome to join us for a glass of Prosecco - and continues daily until Saturday 31st October. Open Monday-Saturday 10am-5pm, plus Sunday 25th October 11am-4pm. John will be in attendance at the preview to sign copies of his book and will be available to chat to about his work and history in the industry. 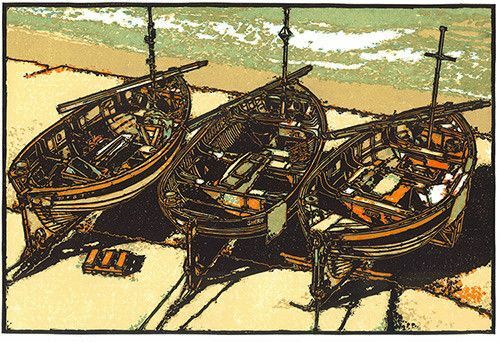 He will also be demonstrating his linocutting techniques during two sessions - morning and afternoon - on the preview day.